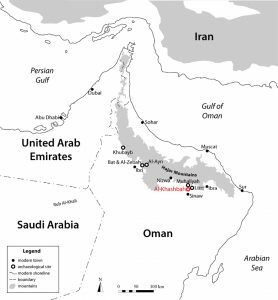 The site of Al-Khashbah is located in the Shamal Al-Sharqiya governorate, about 18 km to the northeast of the modern city of Sinaw at the southern foothills of the Al-Hajar Mountains. It extends more than five kilometres east-west and up to two kilometres in a north-south direction and is the largest known 3rd millennium BC site in the region. Al-Khashbah is characterized by at least nine monumental round buildings, so-called towers. The site is mentioned in the literature early on as it features with Building IV a unique structure that in contrast to all other 3rd millennium BC towers has a rectangular and not a round ground plan. 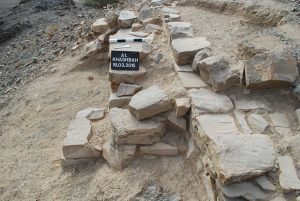 The excavations at Al-Khashbah have taken place since 2015 by a team from the University of Tübingen under the direction of Conrad Schmidt in the course of his DFG (German Research Foundation) project “The development of complex societies in northern inner Oman in the 3rd millennium BC”. The aim of the project is to investigate the early phase of the cultural and socio-economic developments of the Bronze Age in inner Oman. In 2015 intensive field-walking surveys were conducted at Al-Khashbah covering systematically and completely an area of 20 hectares. All finds were collected and each one of them given its coordinates with a handheld GPS (Garmin eTrex 10) device. In total, 18,000 objects were document in this manner and are presented using web GIS, so that the special distribution of selected artefacts by object type, date, typologies and other criteria can be displayed and analysed. 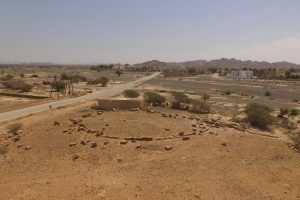 The oldest structures at Al-Khashbah are 205 Hafit period tombs that stand exclusively on a chain of small hills (web GIS). They are above-ground, truncated cone shaped stone buildings. Beside the tombs there are also monumental structures of the Hafit period (3100–2700 BC) at Al-Khashbah, three round buildings made of stone and a large mud-brick complex. In the Umm an-Nar period (2700–2000 BC) there are far fewer, but larger, above ground stone tombs. These are located in the plain in the centre of Al-Khashbah. There is only one domestic structure, Building X, from the Umm an-Nar period known from Al-Khashbah. This lies in the north of the site. 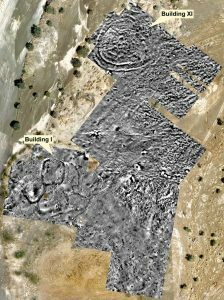 In addition, five monumental round buildings made of stone, dating to the Umm an-Nar period, are present (web GIS). For the following Wadi Suq period (2000–1600 BC) only around of six tombs are documented. Following the Wadi Suq period there is a long hiatus at Al-Khashbah. Not until the Late Islamic period is the site resettled. This includes the modern palm oasis as well as the abandoned village of Safrat al-Khashbah in the far east of the site. Since 2015, Building I has been archaeologically investigated. Building I is a large complex consisting of several mud-brick buildings that are encompassed by large ditch systems. The complex measures 80 x 80 m and is situated on a natural elevation directly next to the wadi. The buildings are divided into small rooms of more or less the same size. Their construction is characterized by the combination of mud-bricks and stones. For the encompassing ditches, it has been demonstrated that they are up to 4 m wide and 3 m deep. The survey in 2015 as well as the excavations yielded primarily slag and stone tools. Hence, two activities were reconstructed for the building: copper processing and the production of stone tools. Charcoal samples date Building I to the late Hafit period around 2800 BC. 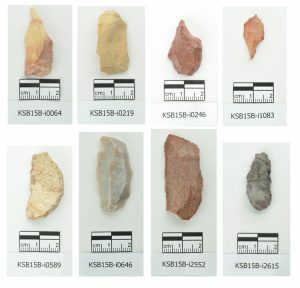 Stone tools from Building I. Building II is located in Area G to the northeast of Al-Khashbah on a rock cone directly next to the wadi. Its circular main wall on the top of the hill is best preserved. The double-sided wall has a diameter of 28 m. In the northeast of the main wall, a possible entrance with an adjacent stone floor was uncovered. It is flanked on both sides by projections of the wall. In a second test trench in the east of the building a natural cavern in the rock was excavated in which a trodden floor surface was revealed below one and a half meters of accumulations. No slag or furnace fragments were found during the excavations of Building II, though Umm an-Nar period pottery was recovered. Charcoal samples from the stone floor from the interior of the main wall date Building II to the beginning of the Umm an-Nar period around 2600 BC. Projection of the wall in the northeast of Building II. With a side length of 29.50 to 30 m Building IV is nearly square in plan. Each of the four sides features a wall projection. They are all situated to the middle of the wall, only the one in the east is further south, possibly to make space for an entrance to the building in the northeast. 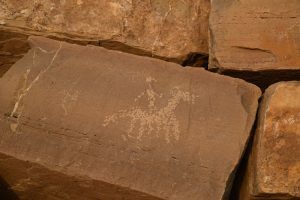 Here lies the by far largest ashlar of the structure with a length of 2.80 m. In the northeast, the external wall of the building is preserved to a height of 2.20 m. Here, a group of petroglyphs from the Islamic period that depict riders, horses, camels and geometrical symbols are located. Building IV clearly dates to the Umm an-Nar period (2700–2000 BC) as numerous pottery sherds from the surface demonstrate. Petroglyph at the external wall of Building IV. Building V is located directly at the edge of the wadi vis-à-vis the modern palm oasis of Al-Khashbah. It features a circular main wall with a diameter of 25 m and a preserved height of 1.10 m. Excavations have been conducted here since 2015. 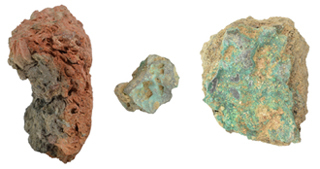 Thereby intensive copper processing could be demonstrated by thousands of oven fragments, copper slag and metal prills. Charcoal samples from the same deposits as the metal production remains date to the beginning of the Hafit period around 3200–3100 BC. 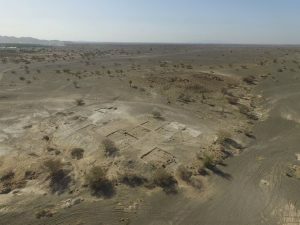 This makes Building V the oldest known monumental building of Oman and simultaneously the oldest evidence for copper processing. Building V seen from West. Furnace fragments and slag from Building V.
Since 2015 geophysical prospection has been carried out continuously. Building I, Building V and Building VII were investigated by Jason Herrmann from the University of Tübingen in 2015. Dominique Ngan-Tillard and Martijn Warnaar studied Building I, VIII and IX in 2016. In 2017 Jörg Faßbinder and Marion Scheiblecker from Munich University conducted work at Building XI. The most important results of the magnetometry are the large ditch systems around Building I and Building XI. 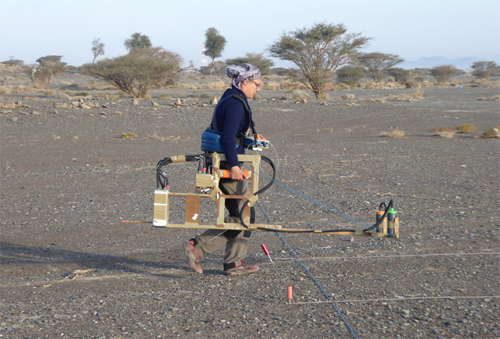 Marion Scheiblecker during the geophysical prospection in Area B. Results of two magnetic surveys in Area B (J. Herrmann, J. Faßbinder, M. Scheiblecker).